Welcome to our 6th Harvest Week! Farmer John invites you to our Open House, Saturday, July 19, featuring Farm Travel Adventures and The Selfish Giant, a Free Puppet Play by Blair Thomas. He also invites you to the Annual Farm Dinner Benefitting the Angelic Organics Learning Center on Saturday, July 26. See details below. The season has been cool so far. But, as they say about the stock market, past performance is no indication of future results. With weather and markets (and life), anything can happen. Primo (left) and Pollo (not shown) upgraded our cucumber harvester with a walkway and harvest bucket hangers, cutting cucumber harvest time almost in half. 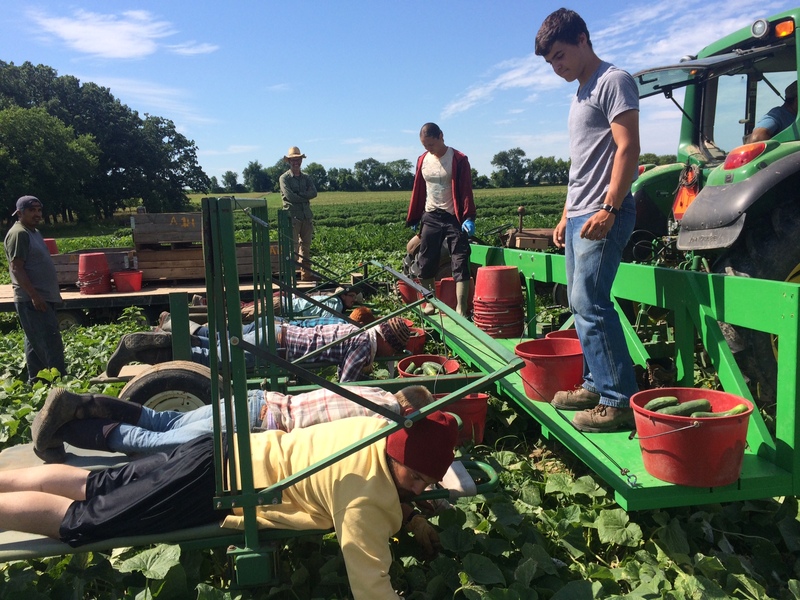 Hovering over the vines, instead of trampling them to find the cucumbers, results in longer lasting vines and greater yields, plus, it’s easier on or crew. Zucchini and summer squash are in full swing. Cucumber harvest quantities will double in the next couple of weeks. 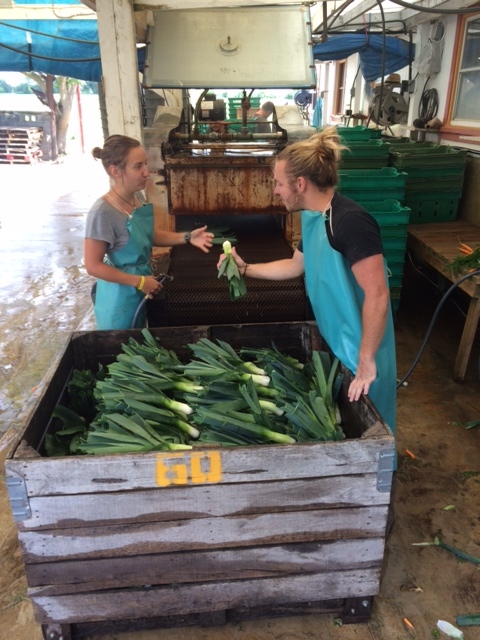 Sweet corn, melons, peppers, eggplant will soon be in your box. Tomatoes know no shame…have yet to blush. Presented by premier Chicago and Rockford chefs, including Chef Paul Virant. We’ll enjoy a five-course gourmet meal made with seasonal produce fresh from Angelic Organics and other sustainable, local ingredients. Jeep rides by Farmer John. Live Music. Farm Tours. It’s going to be fun! 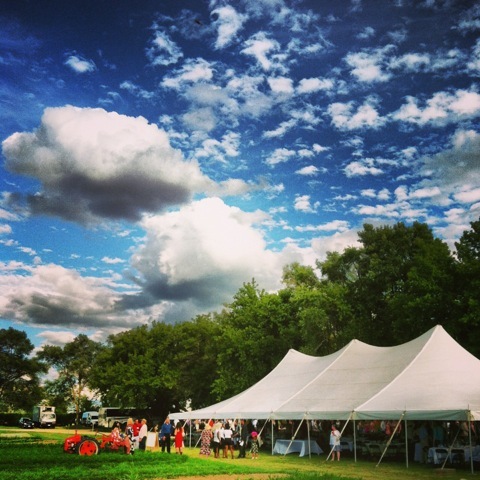 All proceeds from the Farm Dinner support our educational programs that build the local food system.. Note: With the I-90 construction from Elgin to the Rockton Road exit, expect that 45 mile portion of the drive to take over an hour. 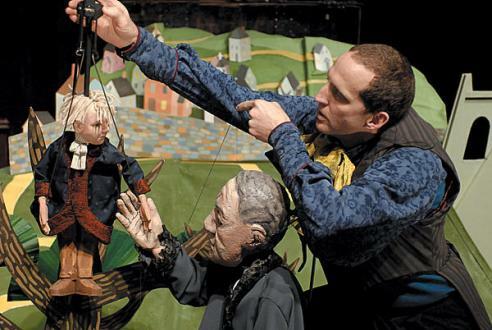 11:30 – 12:15: The Selfish Giant Puppet Play in the Woods at the Learning Center Campground. A puppet play for all ages by two Chicago Theater Icons, Blair Thomas and singer-song writer, Michael Smith. Original puppets and music tell the story of a grumpy old giant who forbids the children in his village from playing in his beautiful garden. After the children are locked out, the trees and flowers refuse to grow and the garden plunges into an eternal winter. Then one morning, the children sneak back into the garden, bringing with them the joyous rebirth of spring. Farm Travel! Travel the farm with your Farm Fun Passport on July 19! 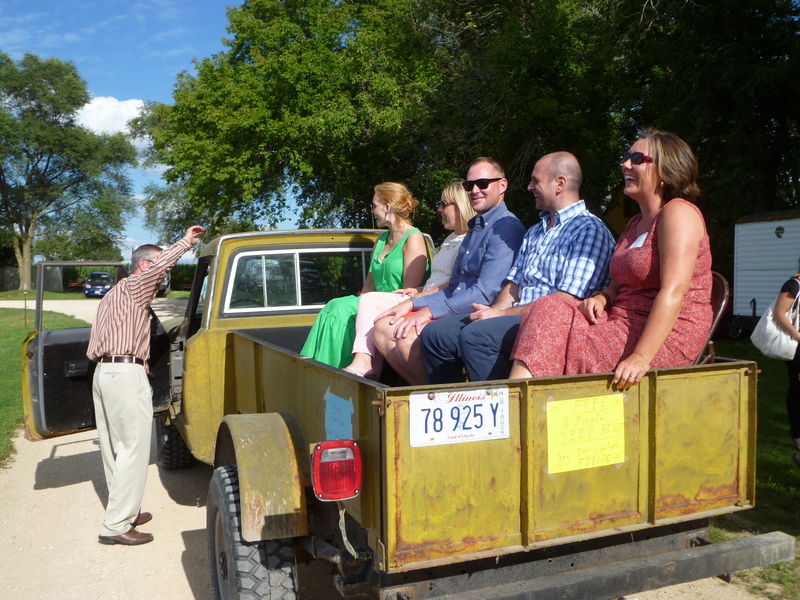 We’ll stamp your passport as you take a hayride through the fields, and you meet the goats, pigs, and chickens. 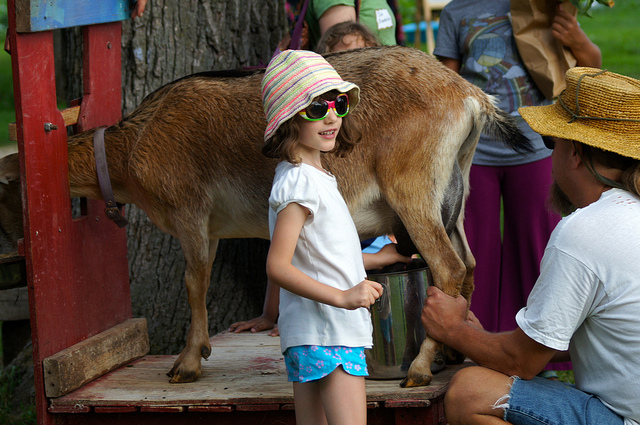 Stop by the Learning Center for a delicious taste of farm-fresh goat’s milk ice cream. * The dishes at past open houses have always been phenomenal, but sometimes we run short on food–this is not to be on a farm that is all about food! Please bring a dish that will serve at least 15. * Farmer John & the hard-working crew say that more desserts would be appreciated. * Please bring your own place settings & beverage. We furnish some tables and chairs. Please consider bringing a blanket on which to picnic, so we don’t have to provide so many chairs. 1:45 to 2:30: CSA Meeting Offer suggestions about food & farming.